The Pacific Science Center has a new exhibit called “Block by BLOCK: Innovating from the Ground Up,” highlighting the BLOCK project, a unique approach to the homelessness crisis in Seattle. The organization builds small homes that are completely off-grid and self-sufficient, and designed with functional amenities for people experiencing homelessness. Cool. But what really sets the BLOCK project apart is where these houses go. Unlike other tiny home communities, BLOCK homes are placed in the backyards of volunteers who agree to use their land to welcome a new neighbor. The project’s ultimate goal is to place a BLOCK Home in the backyard of one single-family lot on every residentially-zoned block within the city of Seattle. The Pacific Science Center exhibit features a model BLOCK home, as well as details about its sustainable credentials. Visitors can watch a video where Bobby, the first BLOCK home resident, walks viewers on a tour of his space. Displays throughout the exhibit feature black-and-white photos of people experiencing homelessness, as well as information on issues tangential to homelessness in Seattle, like employment, or perception of the homeless population. You might be asking yourself, “why is there an exhibit about homelessness at the Science Center?” You wouldn’t be alone. But according to Vice President Dianna Johns, who helped bring the exhibit to the museum, this cross-sector, community-based solution is just the type of discussion of innovation and critical thinking the Pacific Science Center seeks to inspire. “We tend to think of innovation as technology, not writ-large as the social sciences. But innovation can look like a lot of different things,” Johns said. The BLOCK project’s innovation draws from its multi-faceted approach. Using sustainable development technologies in yard space that’s already available minimizes the resources required. It also forces the community – ranging from neighbors and local community organizations to engineers and developers – to band together, literally saying “yes in my backyard,” to address the problem head on. On November 1st, the Pacific Science Center held an event to discuss this and other community-driven innovations to homelessness in Seattle. KUOW reporter Kate Walters moderated a panel including Heather Fitzpatrick, CEO of Wellspring Family Services; Jonathan Kumar, founder of Samaritan; Mark Putnam, Executive Director of Accelerator YMCA; and Daniel Malone Executive Director of the Downtown Emergency Service Center (DESC). The panelists represent a just a few of the Seattle organizations working to address homelessness, and came together to share elements of the work they are doing in the community. Wellspring focuses on families experiencing homelessness, while DESC works to house individuals with mental illness, substance use disorders, and other disabilities. The YMCA is working on a program similar to BLOCK where individuals can volunteer a spare room in their home for a young adult in need of temporary housing. Samaritan, a Seattle-based organization, is the newest in the group. Kumar and his team developed an app that enables users to send money to participating homeless individuals using Bluetooth beacons. The app notifies a user when they are close to a beacon holder. Users can learn about that person’s story and donate money that can be used at partnered stores, or for longer-term goals. Whether the organizations were tech-focused, like Samaritan, or long-standing community organizations like the YMCA, all agreed on the value of community-driven innovation. The speakers collectively defined it as like-minded individuals banding together to address a problem – without waiting for a solution from the public or private sector. However, one critical issue the panelists all shared is community fatigue. 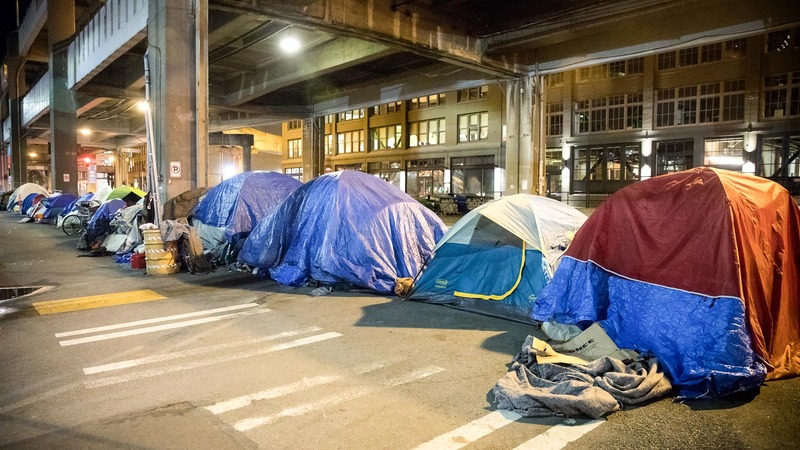 Three years ago the city of Seattle declared homelessness to be a state of emergency. Yet the problem seems to only be growing worse. “People don’t know where to put their frustration,” said Putnam. Losing public momentum limits how well community-driven solutions can realistically work. How do you inspire action in an environment of fatigue and frustration? Given Seattle’s role as a tech city, the conversation inevitably shifted to the role of tech innovations. Panelists agreed it plays a key role, but argued that fundamentally the issue comes down to community members making a choice to get involved. In the case of Samaritan, tech can “transform and scale generosity” – letting more people get involved in an organized way. But, it still requires those individuals to decide to make a move. So how do you inspire that kind of action in an environment of fatigue and frustration? It’s a question of great concern to Comm Lead, as the focus of our Partner Program for 2018-19 is housing affordability and homelessness. The premise of the Partner Program is that student expertise can be leveraged to elevate and unify the work of key front-line players on a specific issue, with student consultants booting the communication capacity for non-profit organizations working in that sector. Last year, the focus was ocean sustainability, with student projects for dozens of diverse environmental, marine science and fisheries organizations culminating in the oceanlinknw.com website. This quarter students are already working with Habitat for Humanity Seattle-King County, Byrd Barr Place, and Downtown Emergency Service Center (mentioned above), with many more projects to come in winter and spring quarters. Ultimately, whether the Partner Program projects this year entail videos, messaging strategies, or outreach campaigns, the human element is central to their success. At the Pacific Science Center event, that ethos was reflected by Sarah Vander, Community Director at Facing Homelessness, which funds the BLOCK project. Facing Homelessness began as a social media photojournalism project, showing a side of homelessness that few have the chance to experience. While it has grown over the years, the focus has remained on their mission of “humanizing homelessness,” and inviting the community to be a part of the solution. It seems simple on the surface, but this human storytelling is essential. Without the connections forged through these stories, it seems impossible that someone would choose to have a BLOCK home built on their property. Speaking to the role of storytelling, Vander asked the audience to distill the often-overwhelming idea of homelessness down to the people impacted, and offered a reminder that everyone can play a role in opening up a conversation, understanding, and identifying with the individuals who are affected.